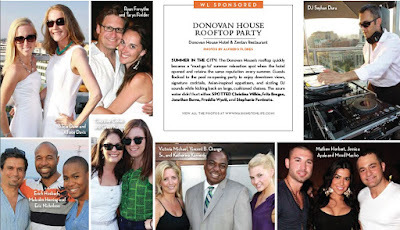 Summer In The City: The Donovan House's rooftop quickly became a "must-go-to" summer relaxation spot when the hotel opened and retains the same reputation every summer. Guests flocked to the pool re-opening party to enjoy downtown views, signature cocktails, Asian-inspired appetizers, and sizzling DJ sounds while kicking back on large, cushioned chaises. The azure water didn't hurt either. Spotted Christina Wilkie, Fritz Brogan, Jonathan Burns, Freddie Wyatt, and Stephanie Fontnote. Erich you look great in this pic!